Motor oils are one of the major advancements of the modern era this coupled with improved manufacturing techniques has resulted in massively increased engine reliability and performance. There are staggering amount of different oils and lubricants available to suit virtually any machine type irrespective of age. 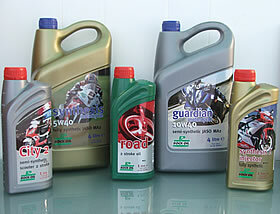 A large selection of Rock Oil motorcycle oils and lubricants are kept in stock and additional oils are available on request. The design and quality of crash helmets is another area which has seen great improvements in recent years and the introduction of Sharpe testing has shown that you do not necessarily need to spend a massive amount of money obtain a helmet that scores highly in the safety tests. The most important thing to consider when buying a new helmet, irrespective of style or design is that it fits correctly. The protective qualities of a helmet deteriorate with time and wear and most manufacturers recommend replacement every 3 – 5 years depending on usage and immediately following a crash or impact that may have compromised its integrity.